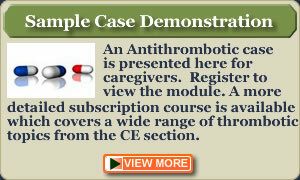 CareInternet.net sponsors a detailed primer on antithrombotic therapy for caregivers. 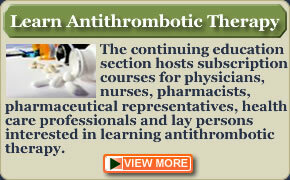 Many anticoagulation drugs and therapies are discussed. This resource can be printed out and you may contact CareInternet.net with any questions you might have about the therapies and indications. Click the modules links at the right of the page to view each educational module in order. You may print each section individually or click here to view the entire discussion on one page for easy printing. 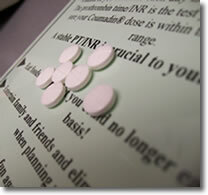 An example of a sample case is presented at the end of the warfarin module. You may test your knowledge by completing the test and then move on to the discussion to see how the physician diagnosed and treated the patient.